The draft will take place over the next three days, starting with the first round, supplemental round, and second round on Monday beginning at 7:00 pm on MLB Network. Every outlet that covers baseball has begun speculating on what will take place tonight, but the only preview that should really matter to SoxProspects.com readers is Editor-in-Cheif Mike Andrews annual Draft Preview. Mike has a strong track record of success in predicting who the Red Sox will be looking at, and in this year's preview, he mentions Clemson first basemen Seth Beer (pictured, above), Mississippi lefty Ryan Rolison, and Oklahoma outfielder Steele Walker, among others, as possible first-round picks for the Red Sox. Read the preview to get the rest of the first-round possibilities, as well as second round, middle round, and late round names to remember. Mock drafts have been flying off the shelves over the last couple weeks, and many others are thinking the same way as Andrews by predicting the Red Sox to select Seth Beer with the 26th overall pick. Beer is universally said to be a hitter with a solid approach and good power, but a likely future DH, limiting his market. Andrews notes that he has also struggled a bit when he has hit with a wooden bat in showcases and with team USA. However, he has had two strong years of performance for Clemson, a No. 1 seed in the 2018 NCAA baseball tournament before being eliminated on Sunday. Some of those other mock drafts include ESPN's Keith Law's third edition, MLB.com's Jonathan Mayo, Baseball America (with a bonus video of Beer), and Mike Axisa of CBS Sports (he also mentions high school right-hander Mason Denaburg). This morning, Law also released his fourth and final version of his mock draft and this time he has the Red Sox selecting another player mentioned by Andrew's in his draft preview in shortstop Brice Turang out of Santiago High School in Corona, California. Law mentioned this possibility in his third edition as well but had him being selected earlier. 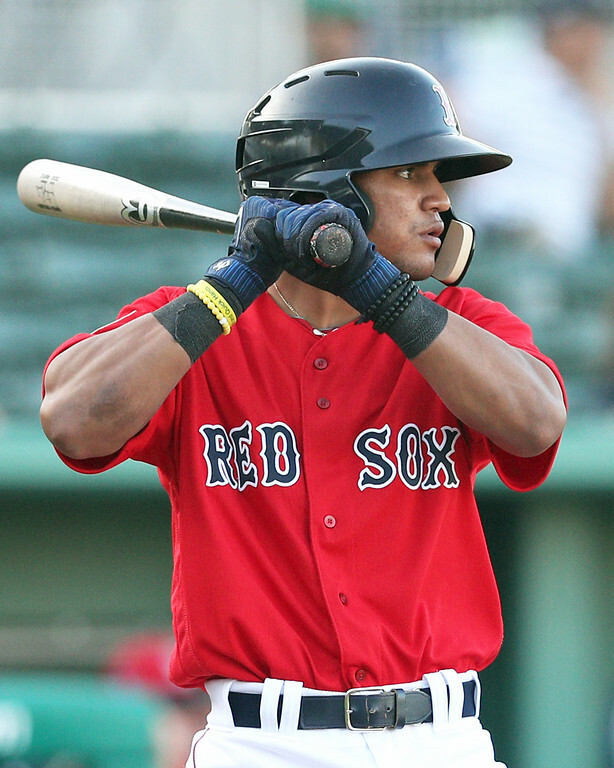 Law was not alone in pairing the Red Sox and Turang, with MLB.com's Jim Callis, who always seems to have a good read on the Red Sox, also putting him in that spot in his final mock draft this morning. This selection would certainly seem like a steal for the Red Sox since Turang is ranked 13th by Perfect Game USA and ninth by Baseball America. Turang is one of the biggest names among high school players in the draft, playing in most of the major showcases over the last couple years and for Team USA. However, over the spring his stock seems to have fallen a bit, and while previously being mentioned as a top-10 pick, most have him in the middle-to-back end of the first round now. Baseball America describes him in the following way, "Turang might not be filling up a scout card with 6- and 7-grade tools, he does everything well, has a long track record of succeeding against elite competition and plays a premium position as a left-handed hitter." Perfect Game USA in their most recent mock draft mentioned another player on Andrew's list of potential Red Sox first-round targets, Steele Walker. Both Andrews and Perfect Game USA state that while Walker will likely move from center field to a corner spot down the line, his hitting tools and all around solid game merit the first round selection. PG adds the Red Sox have been scouting Walker heavily in recent weeks. Not mentioned in Andrews' preview, both FanGraphs and Beyond the Boxscore listed power-hitting high school corner infielder Triston Casas as their Red Sox first round pick. Fangraphs believes the Red Sox have been on Casas all spring, but many other mocks had him going off the board before the Red Sox. MLB.com's Ian Browne also previewed the draft covering potential picks and a general state of the system, which Browne believes they are trying to restock after a series of promotions and trades have left the system with some holes. Despite the down year for the system, the Red Sox won't be able to fix it with one big swing in the draft writes The Athletic's Chad Jennings. If you are interested in local prospects, both Baseball America and Perfect Game USA have you covered. Baseball America previewed the top players from Massachusetts (every state is available) and Perfect Game USA has a post with the best players across New England, broken down state-by-state. The SoxProspects.com players of the month for the month of May were announced at the end of last week. Santiago Espinal taking home the hitter of the month and Denyi Reyes taking the pitcher of the month. Espinal hit .346/.393/.580 with 5 home runs to earn him the spot, while Reyes led the system in innings pitched, ERA, WHIP and batting average against while finishing the month with 37 strikeouts to only four walks. The Red Sox have moved 23-year-old righty Travis Lakins to the bullpen full time. Lankins, who had struggled to stay healthy over his first four professional seasons, has thrown 19 innings for Portland this season over 6 starts and two relief appearances with a 4.26 ERA, 1.42 WHIP, and 25 strikeouts to 7 walks. His first appearances out of the bullpen have gone well, throwing an inning in each with a total of 2 walks and 5 strikeouts. We want to continue to keep SoxProspects.com free as it always has been. While we do generate revenue from ads on the site, the costs to provide first-hand scouting accounts and run the site exceeds those ad revenues. Therefore to help support the site and keep it free, the staff here solicits donations once a year. The owners do not take a profit and any contributions will go directly towards running the site. Every donation, even if it is just $5, is hugely helpful and appreciated. Please consider donating today. Dalbec (pictured, right) has really struggled to start the season, but over the past week or so has really started to see things turn around. This was easily his strongest week of the season with an extra-base hit in four-of-six games. Perhaps most impressively, he only struck out twice all week, an area that has always been a problem for him since turning pro. Even including this strong week, he still has struck out in over 32 percent of his plate appearances this year, resulting in a .208/.344/.455 triple slash line buoyed by a 14 percent walk rate and 9 home runs. Dalbec saw his spot on the SoxProspects.com rankings drop to 13th in the June release, but hopefully, he can reduce his strikeout rate and start to climb back up. Shepherd was able to put it all together for two very strong outings this week while throwing the most innings in the system. In each start, he went 6-plus innings, giving up 4 hits and a single earned run. That brings his season line to 3.93 ERA, 1.31 WHIP, and 46 strikeouts to 14 walks. Shepherd got off to a very slow start this season with a 7.36 ERA over his first four starts of the year allowing an OBP to opposing hitters of .386. He has been on fire ever since with a 2.10 and .264 OBP against over his latest 6 starts and 34 1/3 innings pitched. Photo Credit: Seth Beer by Clemson University. Santiago Espinal and Bobby Dalbec by Kelly O'Connor.